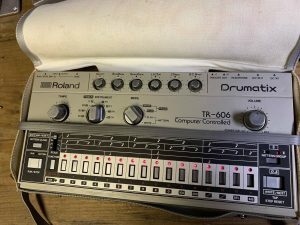 “It is Roland TR-606. Although it is only the main body, the cover is attached. There was no adapter, I was able to confirm energization by batteries. 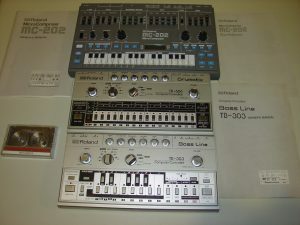 I have: The three most sought after “Roland Originals” from “the 90’s”! All three were used only “6 months” out of the last 23 years! I know their complete history. I purchased them new in the box. In their only six months of use; I, alone used them. No one else but I have touched them since1995! 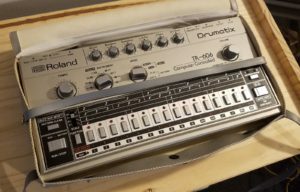 You won’t find “Original” Rolands as “unused” as these are! Being as“unused” as they are enables them to be in “perfect working order”! They were always kept high and dry. I have tested them through the years, and again just now. Again: All four are in “perfect working order”! These “very Rolands” are “UP FOR BID” Right HERE!! Right NOW!! #1 The “Bassline TB-303″ Bass Guitar Synthesizer, with carrying case. “This is the “most famous of these Roland’s”! #2 The Roland’s MicroComposer/Synthesizer Board” MC-202 (Complete with Data Cassette). 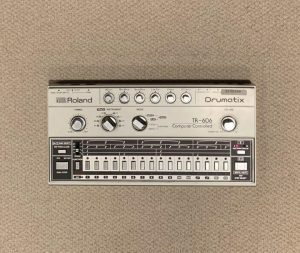 #3 The Roland’s “Drumatix TR-606”, Drums and Rhythms Programmer,with carrying case. These three Rolands were designed to work together as a team. When synced up, they make a “programmable studio”, that anyone, (even non-musicians) can use to make any type of music! The endless sounds and rhythm patterns, created by these three units will make perfect “back up music”, anytime and as often as you want! You can then layer vocals in, creating any complete song of your choosing! You can also make endless, beautiful instrumentals! You can experiment and layer until you create “THE SONG”!! “THE ONE” you were hoping for! 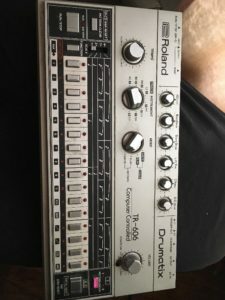 I am selling these three Roland’s as a group. Grouped together they enabled me to become a “songwriter” instead of just a lyricist and singer, which is what I was. I just started with “bare bones” naked song ideas and then built them into great songs! I used no actual musicians, and yet,created 10 very good songs in six months time! One of the songs won me a Billboard songwriting contest! There is no way I could have won that contest without the use of all these great units together!! That’s the reason I kept them. After winning the contest, I put them away. I thought I would use them again, when time allowed. That just never happened, and that’s the reason I still have them. Because of how these units enabled me to do what I did; I know they will make a great addition to “anyone’s studio”, regardless of what they already have! There is only one slight cosmetic blemish on any of these units. 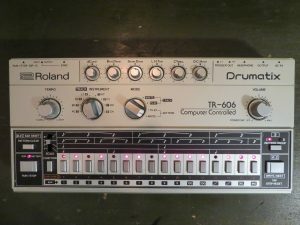 It’s on the bottom and one lower side of the Drumatix. It happened when I spilled a little “Coke soda” in its carrying case. I then placed the unit back in its slightly damp case. I did not realize it until a little later. The gray finish on the Drumatix’s ABS plastic enclosure was marred only where it touched the dampness. That’s it. This only affected the exterior gray finish. 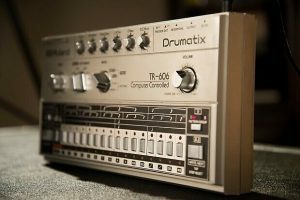 The Drumatix is otherwise perfect! That same spill wrinkled and discolored some of the Drumatix’s Owners Manual’s pages. I am sending an “exact copy” of the Owner’s Manual, that I printed off,from the Roland website. In very good internal and external condition, pictures say everything. Everything works as specified, overhauled before shipping to have long life and to keep original sounds. Fully serviced recently including an upgrade of all tactile switches. Functions perfectly, operates and feels like new. Body and battery compartment in very clean condition. In average condition, please see pictures and trust your eyes. 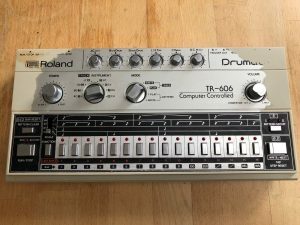 “Near MINT condition TR-606. 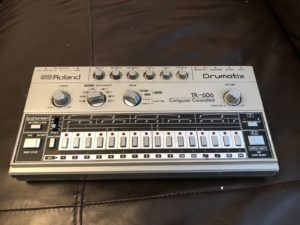 Superb condition cosmetically and functionally – all buttons, knobs, etc. work. Selling for what I purchased it for several years ago. 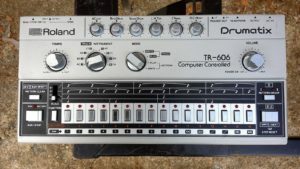 This TR-606 is simply the best you’ll find for sale anywhere. If you’ve been looking for a museum piece, this is it. One scratch that I can see on the bottom, also some black ‘smudges’ on bottom (see video). Thanks for looking and good luck! 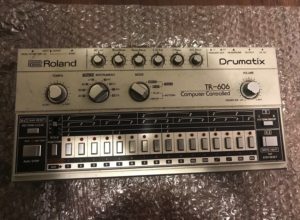 “Up for sale is a Roland Tr-606 Drum machine in excellent condition, everything is tested and works. There are some light scratches on the front panel, a small ding on the back, some scratches and light signs of corrosion on the bottom. The battery compartment is clean inside and fully functional. The item is in excellent condition for its age. There are some minor wear/marks on the body. Basic fuctions work correctly.It sounds great! The voltage for this item is 100V. The item can be used in the United States, we recommend using a transformer for safe use over a long period of time. 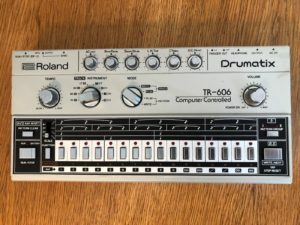 “Roland TR-606 tr606 Drum Machine Vintage rhythm machine w/universal adapter!! This unit is in generally good condition but does have some superficial wear. Everything works fine but a couple of buttons do not make as reliable contact as they used to … you just need to take care a little care when pressing the buttons. The battery compartment is in good condition and the lid is present as shown in the photographs. 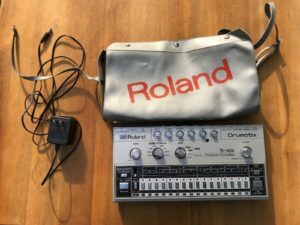 “Genuine sale of original Roland TR-606 in carry case with power adaptor. In good working order with new power supply. Some slight cracks on edge of unit and a few bits of wear around pots. Some small pen marks below 4 of the step sequence buttons. All pots seem clean (although a bit dusty) – no crackling though. Haven’t checked unit with batteries so can’t confirm whether working with those. “There is a time-honored scratches and dirt. Therefore, there is a feeling of use. A rare opportunity to grab both units in one auction! No need to harp on about these units and what they can do, as I’m sure you know what you’re buying and its intended use. I had previously bought this as back up for my studio but it’s surplus to requirements. It has wear and tear as you would expect and I have highlighted what markings I can otherwise it’s as you see it in the pictures. It was serviced by Synthrestore in Bedford a couple of years ago and still holds in tune and works as it should. There are the slightest of fade marks around one or two pots from use and also surface marks on the casing otherwise it functions as it should. A power adapter (not original) will also be supplied and a copy of the manual. Seems to be in good working condition. This is a estate item purchase I found.. I cleaned the terminal and put new batteries in. Everything seems to be working good.